Bonneval – Fall, Doumayrou, Bastareaud, Grosso – Beauxis, Machenaud – Lauret, Tauleigne, Camara – Vahaamahina, Gabrillagues – Slimani, Guirado (cap. ), Poirot. Has Eddie booked his inter-rail ticket from Twickenham station all the way to Paris yet??? Nick Evans writes a decent article. He thinks little panic from EJs and Ford/Farrell axis to remain. "I know precisely what it’s like to play against a France team in the mood. It may be 11 years ago now but I can still vividly remember being part of the All Blacks side who lost the 2007 World Cup quarter-final to the French. It was as if they grew another leg, arm, heart – it was wave after wave and it was unstoppable. There were blue shirts everywhere and it didn’t matter how hard we tried, there was nothing we could do. I’m sure it was a great spectacle but not so good for New Zealanders. The positive thing for England is it was so long ago and France never really seem to produce those performances in the Six Nations – it always seems to be against the All Blacks. If they are to do it though, they need a talisman. Those kinds of performances are always led by someone who galvanises France and then comes the passion, the camaraderie and the togetherness. In 2007 it was Thierry Dusautoir – he made well over 30 tackles – and the most likely player in the current team to do it is Guilhem Guirado. I can’t see it happening, I think the match will be a huge struggle for France but England must be aware they cannot allow them to be in with a sniff after 60 minutes. We saw what happened, or what almost happened, against Ireland when they failed to put Les Blues away and while it may be an old cliche France can create something out of nothing. They did it to England in 2014 – a brilliant try right in the last few minutes to win the game. But I do think England will be too strong, they will have too much of a strong defensive outfit and I think they’ll put the squeeze on. If conditions are going to be wet as the forecast says it will be the George Ford and Owen Farrell show again, pinning back France with their tactical kicking, just like they did against Wales. I’ve said it before but I really do think England are the best wet-weather team in the world. England will give France the ball and say: ‘Go on, go and play’ and if they do, in the wrong areas of the field, England will turn them over and punish them. It may just be penalties but England will be happy with that. They can get that power game back, that squeezing game back into focus and try to take the championship to a last game against Ireland. I like the way Eddie Jones has been taking the pressure off his players since the Scotland defeat and I don’t expect many changes in the pack. Nathan Hughes will be better for having another week training after getting 50 minutes under his belt against Scotland and you’ve got other carriers there with Courtney Lawes, Maro Itoje and Mako Vunipola. Maximising what those kinds of players can do suits them much better than trying to live with Scotland’s high-tempo game. Scotland beat them at the breakdown with pure speed and I don’t think the French will be able to do that. England’s power game will be enough to put them under pressure and they have the carriers to win the gainline. The backline may change a bit – I expect Eddie Jones to find a place for Ben Te’o – but it would be a surprise if he breaks up the Ford-Farrell partnership. Jones won’t panic. Yes, England have lost their last two away matches to the old Five Nations teams but that isn’t a cause for concern. It’ll be something they’ve flagged up in terms of the preparation they do, what they talk about and what they focus on. But it is very hard to win away now. You used to be able to bank on Scotland away and Italy away but it’s not like that any more. France were so wasteful with the ball against Italy and England will be confident in their defence. When you go away from home, your defence have got to be right on the money. On top of that, the set piece is always hugely significant whenever you go up against France. We’ve seen the All Blacks do it – there’s often talk about the All Blacks’ weak scrum – but when they play France they stop them at the source. If you can do that in the first 30 minutes, you’re breaking the camel’s back. The French defensive line will become more and more fractured, people will start switching off a little bit and you’ve got the space to take that opportunity." Let's assume for arguments sake that Hartley is out injured, realistically and psychologically it couldn't have happened at a better time. Firstly whoever gets the shirt will have much of the pressure lifted from them because the expectation on them to perform is reduced, given they're 'just' covering the position. And secondly, psychologically, it enables the team to park last weeks result at the feet of the unsuccessful captain, who by default has been dropped. I've got a lot of time for Hartley, however the argument is going against him and if others step up and the coach is brave enough to ride the wave of change, this could be his stage left moment? So are the alternatives capable? My preference is LCD if he can maintain the required form and fitness. An interesting thought regarding George is that he has always played second fiddle, be that during his development at Sarries or now for England, and whether this has affected his mentality regards his ability to be number 1. I think he's good enough but he needs to step up and seize the opportunity. Ultimately and unfortunately we don't have a Steve Thompson playing in his prime and so we have to reflect that it is a position of comparative weakness. At his best George has been very good- but haven't seen much of the best of him for a while. I thought he was a bit lackluster with the Lions to be honest. Surely the Idea is to win the game first. then, think about the bonus points. lostinwales wrote: At his best George has been very good- but haven't seen much of the best of him for a while. I thought he was a bit lackluster with the Lions to be honest. Yea he was pretty average tbh. Likewise in his starts for England. Seems to be the Care situation, better sub then starter. Is it me or is Trinh-Duc constantly in and out of the squad? yappysnap wrote: Is it me or is Trinh-Duc constantly in and out of the squad? Its not you. I would say that the French side (in the last few years) have been the most unpredictable in selections with very few players getting a run of international games in a row. A very disorientated and disorganised system within the French set up. Teo in for JJ. Jamie George starts and Farrell captain. Watson at 15 and Brown to the bench. Daly starts. They all make sense to be fair. Wet weather so a bulky back row even if I'd prefer a proper flanker it the injury to underhill put paid to that. Te'o to stop route one more effectively given going wide is going to be difficult. Daly for the howitzer boot for pens and clearances. Only surprise for me is brown being dropped but he was supposed to be carrying a slight injury? Whilst many of us have been calling for Watson or Daly to take over at 15 I must admit to being very nervous now. Watson did not impress playing there briefly against the Scots. He offers more in attack, but I think that defence in wet bad conditions will be key. However, England also need to find out if he can play there. No harm giving it a go in the grand scheme of things. No change in the backrow which is due to Underhill's injury and hopefully they will give a big performance. Good to see Sinckler back on the bench. Aahh - the slowest BR in history. Again. My gran could outpace these 3. Hopefully the French side is full of fatties that start wheezing on 50 minutes. I'm worried about the flanks and Watson at FB, not really the game to not be safe at the back. I wonder if Daly and Watson will alternate, Daly is a good option in the air. Sgt_Pooly wrote: I'm worried about the flanks and Watson at FB, not really the game to not be safe at the back. I wonder if Daly and Watson will alternate, Daly is a good option in the air. Watson is better in the air when chasing kicks, Daly when receiving imo. Thus it would actually make sense for Daly to be at FB. I suspect the entire back 3 will be receiving a fair few bombs over the course of the game. How can he drop Brown ? Hes been world claaaas for 20 facking games, mate. Well, there's two ways of playing. You can either try to win first and then think about the bonus point. So if you're 10 points up with 2 tries banked in the 60th minute and you get into the ascendancy, you might then start thinking about scoring the bonus point and turn down penalties for the corner. Or you can start playing like that from the first minute. It's more high risk, because if you don't come off you've turned down a few penalties, so have less points. But if we do come off and score 4 tries against France, chances are we'll win the game anyway because I don't think we'll concede 20+ points against them. Captaincy is still a serious issue for England. Really scraping the barrel leadership wise. Rock bottom. English captaincy means little these days. Guess the only way is up. Hoping George and LCD deliver - I believe potentially both as a combo offer more than Hartley but I agree George's form is a worry. I think the decision to drop certain players is correct but it wasn't one individual IMO who contributed primarily to the loss to Scotland. A free pass shouldn't be given to players who have retained their places. As much as I've supported Itoje - I don't see why he should be immune from being dropped. I do think general fatigue from playing so much rugby and the injuries have affected him but this all more the reason for him to not start every single game. Jones calls it 2nd season syndrome but that's rubbish because a) it's not his 2nd season b) it's Lions fatigue and injuries. A Lions hangover is not a new thing. I don't think Itoje is the only player feeling the wear and tear of a long season. Player management is an important part of rugby and I feel that both club and country have a responsibility to the players. This means managing their workload better. In terms of selection, in his interview he said he wanted a more attacking kick return, which is why he's gone for Watson over Brown. My guess is that he will want Ford and Farrell to pin France deep, kicking to touch where possible with our 3 line-out options. 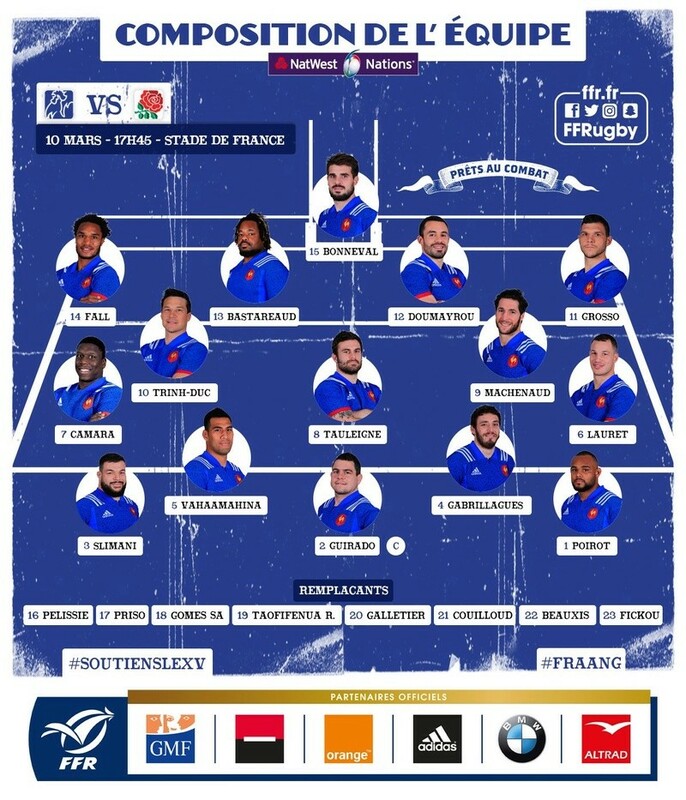 France will then have 3 choices, run it out and risk a turnover from deep, kick it off the pitch which we can attack from, or kick it to our back 3 who will run back at them. I expect France to put up a few kicks to contest when they're in the midfield areas to test us, but if they get them wrong they could be punished from it. I read on twitter an opinion that the bench is set up to chase a bonus point, with players like Cowan-Dickie, Sinckler, Simmonds and Joseph to come on against some of the big French pack and cause chaos. I hope England look to squeeze France early on and go for tries from the word go, but there's certainly some strong open field runners to come on if the game breaks up towards the end. The bench does look to have.more.impact again bar wigglesworth and Brown. a) Jones, Borthwick et al feel they are better served with him playing. Itoje's performances have dipped, but since the Autumn so have Lawes. Even at 80% performance levels Itoje is better than Ewells. I do like a lot of the team but the backrow balance still looks wrong and the "leadership" doesn't fill me with confidence. Londontiger that just means Itoje should be on the bench instead of starting. Put some backrowers in the backrow. Itoje can play but have him as a "finisher" instead at least to prove he can get some form back. He's been ordered to take selfish and smile as captain. Hear he won't be shaking hands though as he wants to save that for the match officials. Basteraud did play well vs Italy. It was a bit of disjointed performance from France overall though and the musical chairs approach at 10 doesn't really hold fear. France's struggles at 10 continue. Basteraud is one of the key Frenchmen alongside Guirado who France will look to raise their spirits. I listened to the BBC podcast interviewing the "normal" Saracens squad members. It did not feel like a fluff piece, but they were all very positive on Owen Farrell's character and leadership withing the group. Of course he is a prickly character, butthen so many of teh best leaders are. Perhaps starting his first game as skipper will temper the abrasiveness just the right amount (as coudl be argued for Martin Johnson way back when). Leadership is an intangible thing which is easy to blame when things go poorly. Good leadership is hard to define (except in terms of match outcomes) and often can only be judged within the context of the team environment or once a leader has departed the scene. There are a number of players throughout that squad who should be leaders, and demonstrate strong leadership in club rugby: George, Launchbury, Itoje, Robshaw, Care, Ford, Farrell, Marler, Haskell, Wigglesworth, Brown. Perhaps it is a failing of the coaching team that not enough of these guys will impose their will on the side when push comes to shove? Leadership (as a group thing, not just the captain) is liable to only make a difference if it is either very good or very bad. It will be interesting to see if he leaves Care on for the whole 80. Or alternatively he might decide with so many "gamebreakers" on the pitch, he wants a 9 who will just get to the ruck and feed those outside him. I think the side is a little "horses for courses" and I would expect a second row and Te'o to come out for Haskell and Joseph for Ireland. In the interview with Eddie Jones, he said he felt Joseph would do a good job against Scotland but wanted the extra size against France in the centres. I think the same is probably true of the back row. The leadership is an issue, but without Hartley in there it will force other players to take responsibility. It will be interesting to see who steps up (assuming someone does!) Mako as vice-captain seems an odd one because he never looks that vocal on the pitch (normally looks like he's blowing, but to his credit he gets through a lot of work for a front rower! ), but apparently he's been good behind the scenes in training. Ypu never know what's being said in the front row! He isn't the most vocal or a guy who will gee people up though. Read that billy slaps him on the back and he just stares back tryomg.to concentrate on his next job. Different type of leader. LondonTiger wrote: I listened to the BBC podcast interviewing the "normal" Saracens squad members. It did not feel like a fluff piece, but they were all very positive on Owen Farrell's character and leadership withing the group. Of course he is a prickly character, butthen so many of teh best leaders are. Perhaps starting his first game as skipper will temper the abrasiveness just the right amount (as coudl be argued for Martin Johnson way back when). Well that doesn't surprise me - the Saracens squad are a very tight knit unit who go on many bonding holidays together. Farrell lost his head vs Scotland, he will need to not do so vs France. He's an experienced player but needs to not allow then niggle get to him. I see Farrell as more of a hardworking warrior rather who I'd like to see leading England. He's not got the qualities I like to see from a captain. I think Farrell brings passion but he needs more than that. Ypu know the obvious question. What do you want in a leader or more specifically a captain; and do we have that person in the squad? C'mon the fat barsteward has not run since he was mugged by the coffee table in NZ. Waddle rampant maybe. I think it's important for a captain to stay calm under pressure and not lose their cool. Not be prickly. Have good discipline. Set a good example. Be a good role model. Being tactically astute is also important. Also have the ability to adapt to everchanging situations and make good decisions under pressure. To answer the question - is there anyone in the squad? Seemingly no but players I think have the potential. Farrell has some leadership qualities there's no doubting that but I feel there's plenty of flaws also. I don't think there's anyone who has the all round leadership qualities I desire. I think it's indicative of the situation that England have found Greenwood harder to replace IMO than Johnson. Also the holy trinity of the backrow. 2 of NZ's greatest lynchpins were 2 of their best leaders - Mccaw and C.Smith. I believe they have all round qualities as leaders that someone like Farrell or Hartley lack. I agree Farrell s style so far when he's been captain has the potential to p off a ref. He's not going to agree with every decision but he can't roll his eyes or shake his head as he has done. Great test for him this match. As far as I can tell he plays the game.in generally the right way. Surely being worth their place in the team as a player is also important? What about ability to motivate, talk to the ref? Carling, Johnson, Robshaw, Hartley, Beaumont, Dayglo, WJA Davies (1920s), Vickery, Borthwick, Corry. Think Hartley has shown himself to be a good captain. I did raise the point from the scotland game though that there was the Hughes wilson moment and a Farrell neck roll for the 2nd try which hartley should be raising with the ref. He's done so in that oast so I assume that communication between players and captain didn't happen on that day. Wonder if more players will be in Farrells ear if there are any such incidents on saturday. No 7&1/2 wrote: Ypu know the obvious question. What do you want in a leader or more specifically a captain; and do we have that person in the squad? To be honest, there are very few complete captains and you're best off splitting the role. To be captain, you have to be able to raise a team that's got a bit flat, focus a team that's got a bit ragged or excited, liaise with the referee and be tactically astute enough to make good decisions about whether to go for the posts or a scrum or line-out. Robshaw obviously got pilloried for the last one of those in the World Cup (even though it was poor execution as much as a poor decision) and often times seemed to be easily dismissed by referees during the game. I think Farrell has shown he can get on side with a referee (I think he convinced the referee to check a grounding on a try that got disallowed against Australia?) and is obviously going to be heavily involved in penalty decisions anyway. He also is one of the few England players who plays with visible passion, which can be effective in raising a team - and I think we have far too few leaders in that mould (thinking of players like Alun-Wyn Jones and Sexton). So I don't think he's a bad choice for captain. He'll need people beside him. Possibly Ford and/or the 9 to talk over decisions with, or take some of the heat off him in terms of calling plays. Players like Mako and Robshaw in the pack who can keep the pack focussed on their objectives, and could possibly do with another leader in the packs to pick them up when they get flat (Hartley if he comes back into the team? Itoje possibly to develop here?). But if you get that in place I think you have the nucleus of a leadership group, they'll just have to develop their understanding of their roles over time. I wonder if that coffee table has any English relatives? If I was EJ I'd keep Dylan to do the press stuff against France and Ireland and let Faz get on with the real job. Londontiger I agree there's more to a leader than just what I said. I have always thought that Dan Cole could make a good captain for England, think he has a great understanding of the game and always seems to be able to motivate the rest of the team. I know he is coming to the end of his international career but still think that he could have made a good captain.